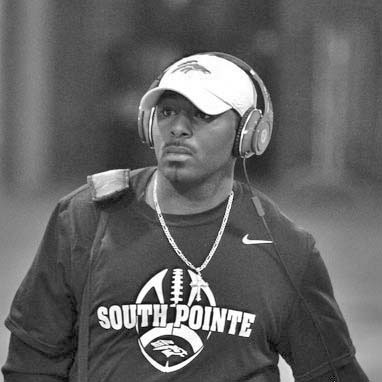 Welvin Simpkins, a native of Edgefield, SC, has completed his 3rd year coaching at South Pointe High School in Rock Hill, SC. This was the 1st year he got a chance to coach the position he truly loves and the position that he excelled at the most while at Strom Thurmond; wide receiver. Previous years he coached the defensive backs. Simpkins played on the Strom Thurmond Lower State Championship team in 1995. He played wide receiver and defensive back, and caught the winning touchdown pass that helped clinch a spot in the State Championship game. Simpkins is married to the former Kesha Bibbs and the son of Willie and Rev. Carmilla Simpkins. Simpkins is a 1996 graduate of Strom Thurmond, a 1999 initiate into the Kappa Lambda Chapter of Kappa Alpha Psi Fraternity, Inc., a 2001 graduate of Clemson University with a Bachelor Degree in Marketing, and a soon to be graduate of Liberty University with a Master of Education (M.Ed) in School Counseling.